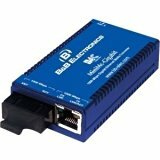 B B SmartWorx IMC MiniMc-Gigab..
Media conversion's greatest benefits are flexibility and cost savings. 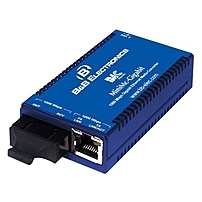 br br Measuring less than 3.5 inches deep and 2 inches wide, the MiniMc Gigabit is the industry's smallest gigabit media converter with both data connections on the same side of the unit, and at a fraction of the cost of other alternatives. Plug and play operation with a variety of model types and powering options make the MiniMc Gigabit easy and convenient to use.